MIKE ROZMAN/WARNER BROS.Sen. 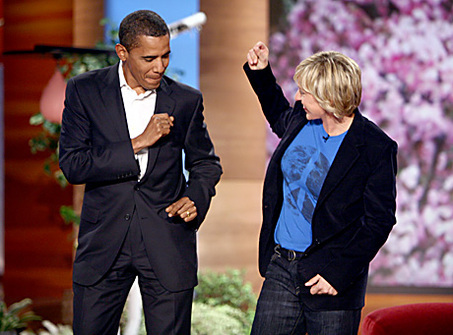 Barack Obama dances with Ellen DeGeneres before the the taping of her talk show Wednesday. It apparently takes a presidential candidate showing off his smooth dance moves to take Ellen DeGeneres‘ mind off thetragic plight of Iggy, the Brussel Griffon mix she adopted and gave away, sparking the ire of the agency that rescued the dog, death threats to the agency’s owners when they took back the pet, and entirely too many headlines. DeGeneres vowed on Thursday’s show that she wouldn’t talk again about Iggy until the dog was returned to her hairdresser. DeGeneres and her partner, Portia de Rossi, had adopted the terrier mix, but it didn’t get along with the couple’s cat, so they gave the dog to her hairdresser, whose two young girls bonded with the dog. But when the rescue agency called DeGeneres to ask about the pet, and she told them she found another home for Iggy, three women from the agency arrived at the hairdresser’s home on Sunday and took away the pet. DeGeneres made two pleas on her talk show to return the dog to the family, but the agency said it wouldn’t. Meanwhile, Barack Obama! Presidential candidate! Dancing! Ellen DeGeneres gave her hairdresser the Brussels Griffon mix she and partner Portia de Rossi adopted from a rescue agency because the dog didn’t get along with their cats. But that’s a no-no, according to the agency, who found about the switch, showed up at the hairdresser’s home on Sunday, and took the dog back, to the dismay of the hairdresser’s children, the Associated Press reports. DeGeneres sobbed when owning up to the story on her show Tuesday, admitting she was wrong to have not carefully read the adoption documents but begging the agency, Mutts and Moms, to give the dog back to the kids, according to a transcript. The most compelling bit of television Tuesday — maybe for the whole week — involved a dog named Iggy and daytime talkshow host Ellen DeGeneres. For those who missed it, Ellen — a big animal lover — adopted Iggy from a private animal rescue agency but theÂ Brussels Griffon mix terrier didn’t get along with her cats. (She spent $3,000 trying to get Iggy and the cats to get along.) So, Ellen gave Iggy to her hairstylist’s family and he immediately bonded with the hairdresser’s daughters, ages 11 and 12. All’s well that ends well, right? Nope. It seems that when Ellen and her partner — actress Portia de Rossi — adopted Iggy, they signed an agreement with the agency — Mutts and Moms of Pasadena — that they would not give the dog to another family without informing the agency. So the owners grabbed the dog back. That led Ellen making a tearful plea on Tuesday’s show for Mutts and Moms to return Iggy to his new family. 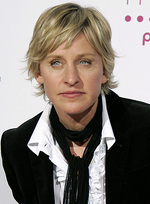 â€œIâ€™m a human being and I have bad days and I have sad days,” Ellen told her audience. “But when I walk out here and you all cheer and when youâ€™re here to dance, youâ€™re here to laugh, and I know I make people happy it changes my mood. I come out here and I can do anything because of the energy I get. But today is a hard day for me. Today is bad. I am not capable of coming out and pretending to be funny and â€˜onâ€™ when things are going so terribly wrong right now. Iâ€™m so sorry – Iâ€™m just not able to pretend. End result: A furious online debate (most sided with Ellen but not all), segments on the network and local TV newscasts and, according to their attorney, death threats made against Mutts and Moms owners Marina Batkis and Vanessa Chekroun. The owners are digging in their heels and areÂ flatly refusing to return Iggy — saying they won’t be bullied by DeGeneres. So far, Iggy has not been available for comment.